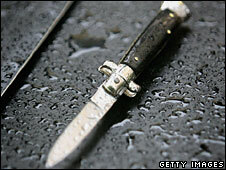 More than half (55%) of young people fear becoming victims of knife crime in the summer months, a survey has shown. The poll, commissioned by BBC London, surveyed 501 people aged 13 to 18 in the London boroughs of Brent, Croydon, Hackney, Lambeth, and Southwark. The survey also revealed 75% do not think London Mayor Boris Johnson and the government will be able to reduce knife crime over the coming months. Mr Johnson said his office will tackle the issue make a long-term difference. He added: "I think its going to be a counsel of despair to say that we can't make a difference, that this is all beyond us. "We are making a difference with the policing solutions, with the stop and search, lifting knives off the streets and we are going to be making a difference in the long-term by changing the lives of kids who are currently going wrong." Kit Malthouse, Deputy Mayor for Policing, said: "It's about intervening in schools and a cultural change to stop people carrying knives." "The survey also says that the major reason for young people carrying knives is to get 'respect' and one of the things we have to do as a society is show them how unglamorous it is actually to carry a knife." About 45% of respondents said they knew someone who had been a victim of knife crime. That is up from 33% last year, when the poll was last conducted in the same boroughs and among the same age group. Fear of being a victim of crime has increased to 32% from 26% last year as a reason for people carrying weapons. The percentage of those young people who carry knives because they "want respect" has declined from 44% to 39%, but it remains the most popular perceived reason for doing so. The proportion who say the same of gun crime has gone up from 17% to 22% since last November. The survey was conducted by polling company ComRes between 21 and 23 July. The information was weighted to be demographically representative of each borough surveyed. In London alone, 21 teenagers have died in violent circumstances this year. The most recent was 18-year-old Frederick Moody Boateng who was stabbed to death on 17 July in Lambeth.